I know that a lot of people seem to hate on Kristen Stewart but if I’m honest I think that most of the hate that she receives is undeserved. As a face of Chanel she looked incredible in the Rouge Allure Ink campaign and as someone who doesn’t wear much red I thought it would be fun to push myself out of my comfort zone and give this look a whirl, so I hope you like it! I always start with my eye makeup to prevent any fallout or smudging from becoming an issue. 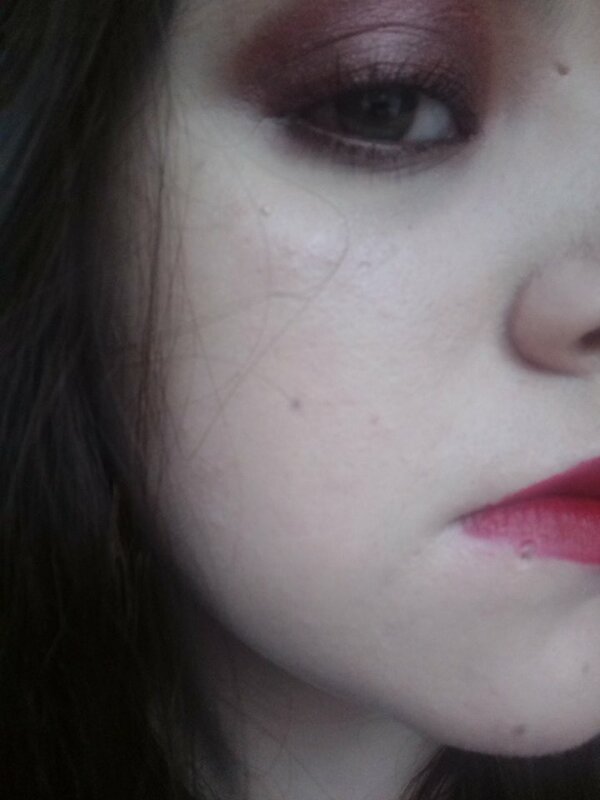 This look features browns and red and I think the shape of the eyeshadow is quite key. I stared by priming my eyes with the Body Shop Instablur Eye Primer I then chose my shadows and I opted for the Urban Decay Vice 3 Palette for this look. I started by going in with the red shade and I used the shade Supersonic all over the lid and in the crease. 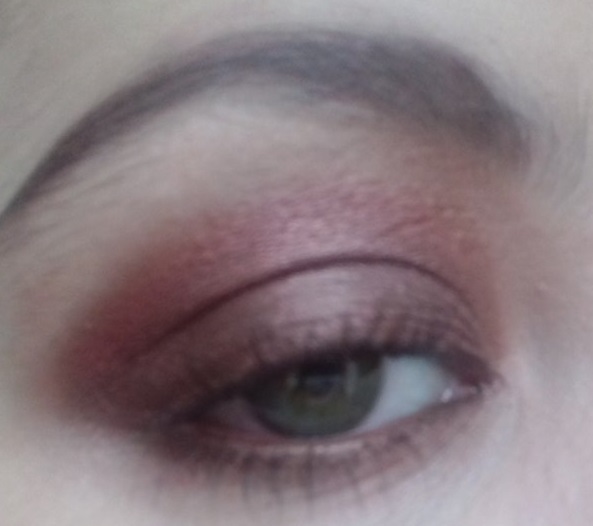 I then took the shade Reign and packed that onto the lid and crease quite messily, once this was done I blended the shades together adding more red and brown where needed. For the inner corner I noticed a slight use of orange so I also added the shade Lucky into the inner corners. I then took a small amount of foundation onto a small concealer brush and then cleaned up the edges. Next was concealer I applied my Maybelline Instant Eye Eraser Concealer under the eyes before moving onto the lashes. I started by applying my Benefit They’re Real Lash Primer onto my upper and lower lashes, I then went in with my L’oreal Telescopic Mascara layering it to create volume. I used the Kiko Intense Colour Long Lasting Eyeliner in Pearly Bronze on my waterline and then used a small amount of the Soap and Glory Supercat Liner on my tightline. For the lower lash line I also added the shade Reign. Finally for brows I used my Sleek Brow Kit in Dark and made sure that my brows were filled in but quite messy for that grungy look. For my face makeup it was actually kept quite simple but I went for a matte look. 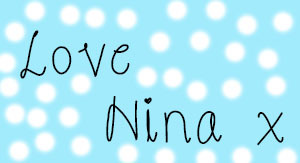 I started by applying primer and I chose the Stila Aqua Glow Perfecting Primer for this. Next was foundation and I used the Rimmel London Match Perfection Foundation and applied it with a sponge. I decided to skip blusher as Kristen’s face isn’t overly done in terms of colour, so I added a small amount of the Benefit Hoola Bronzer to the hollows of my cheeks and my MUA Undress Your Skin Highlighter in Oyster Pink to my cheekbones, nose, cupids bow and on my brow bone. Finally I used the Max Factor Creme Puff Face Powder to mattify my skin. I don’t tend to wear orange red lipsticks as they don’t really suit me plus they make my teeth look yellow so the lips aren’t as accurate as they could be. I started my using a red lip liner and I used the Pattina Cosmetics Moonlove Lip Liner in Scarlet to line and fill my lips in. I then used my 2true 8hr Power Lip Colour in Angelina a product that was sent to me ages ago but is my go-to product for red lips. 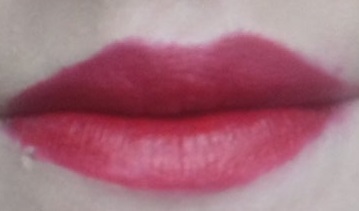 That’s the finished look, it does look washed out due to the lighting but the red lips were a lot brighter in person. I really like this look and I might have to wear it more throughout the festive season! I hope that you enjoyed this post and if you did please hit the like button, let me know in the comments if you are a KStew fan and what you think of this look, would you wear red on your eyes? 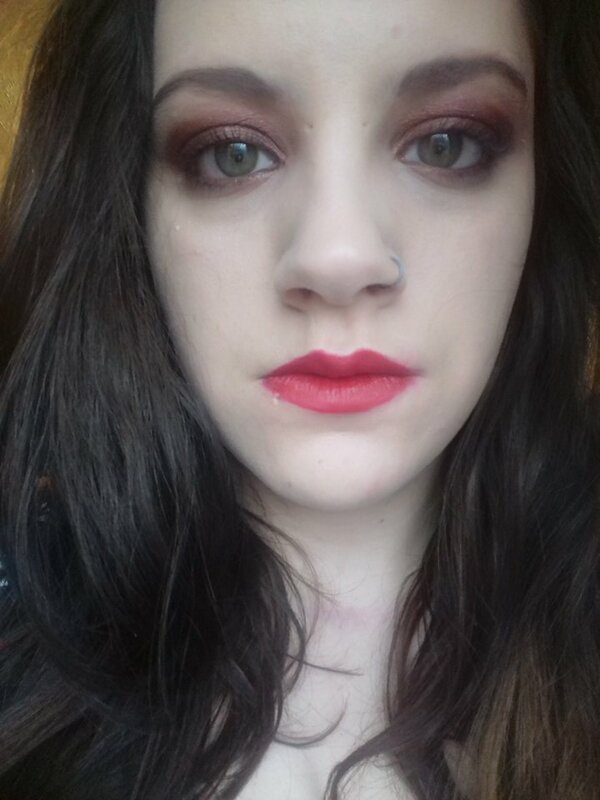 This entry was posted in Makeup Tutorials and tagged 2true, beauty, Benefit, body shop, chanel, kiko, kristen stewart, lotd, lucia widdop, makeup tutorial, max factor, maybelline, Mua, ninarossbeauty, red eyeshadows, red lips, rimmel london, rouge allure ink, sleek, Soap and Glory, stila, urban decay. Bookmark the permalink.